A member of the Bromeliad family, Tillandsia or air plants are native to Central and Southern America. A small number of species extend as far north as the southern states of the USA. Named for the Swedish born botanist Dr Elias Tillandz, the epiphytic Tillandsia genus come in many sizes, shapes and forms. In the wild they can be found in a wide range of habitats ranging from arid deserts and mountainous areas to warm and humid forests. As a genus, Tillandsia are one of the most widespread types of bromeliad. There are upwards of 600 species of airplants currently known, each perfectly adapted to its growing environment as well as countless hybrids. As an epiphyte, airplants take in water and nutrients via their hair like trichomes on the leaves. Without the need for a conventional root system, Tillandsia produce a small root system to anchor themselves onto trees, rocks etc. Many of the species available commercially are of the more arid desert dwelling form: Adapted to a hot and dry environment these arid loving plants generally have a much heavier concentration of trichomes giving their leaves a more silver appearance. The trichomes are not only vital to the plants water and nutrient absorption but also serve to protect the plants from drying out. They work to deflect some of the sunlight off the more tender epiderm of the plants leaf as well as protecting the stoma through which the plants breathe. Generally speaking, the more ‘fluffy’ the trichomes appear the greater amount of sunlight the plant can tolerate. Another interesting adaptation that Tillandsia have made growing in such habitats is their specialised photosynthesis. Most plants will breathe throughout the day and night, but in dry conditions breathing during the heat of the day not only releases unwanted gasses but also moisture. As these arid growing Tillandsia need to conserve their moisture they use a specialised method known as Crassulacean Acid Metabolism (CAM) respiration, keeping their stomas closed in the daytime, breathing through the night when transpiration is less of a concern thanks to the lower temperatures. FLOWERS – Many Tillandsias flower annually. The length of the blooming cycle of air plant varies significantly between species with plants such as Tillandsia Ionantha being a fairly easy bloomer with short lived flowers, other species such as Tillandsia Xerographica can take many years to reach blooming age but its flowers can be produces over several weeks with an floral bract that can remain attractive for several months. Some species such as Crocata, Duratii, Reichenbachii, Straminea, Streptocarpa and Xiphioides have the added bonus that the flowers are scented! 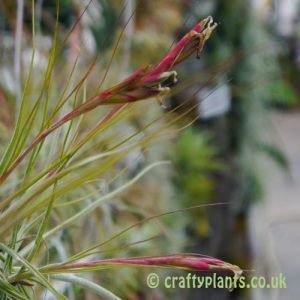 Around flowering season, many varieties of airplant such as Ionantha, Brachycaulos and Capitata also take on attractive leaf colour (blush). REPRODUCTION – Although Tillandsia reproduce by standard means i.e. seed production, they also produce new plants around the parent plant. 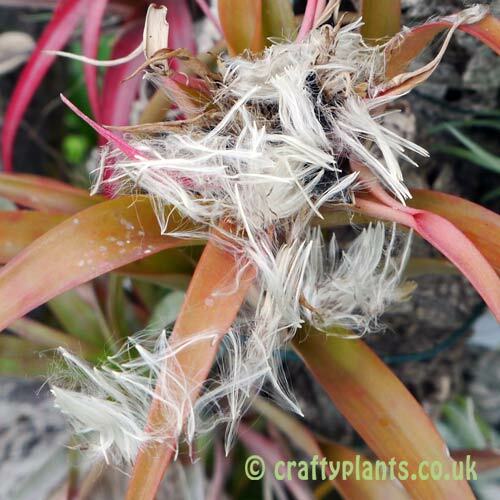 After flowering Tillandsia produce the next generation of airplants as offsets (also known as ‘offshoots’ or ‘pups’). With most species these baby plants appear at the base of the parent plant, a small number of species grow babies from the centre of the plant around the flower spike whilst other species offsets are produced on stolons or short stems. 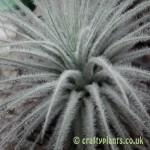 There are also a handful of species such as Tillandsia Intermedia, that produce pups on the spent flower spike itself. These baby airplants can either be left with the mother plant, eventually forming an attractive clump, or removed when they are half the size of the mother Tillandsia plant to grow on as new airplants. 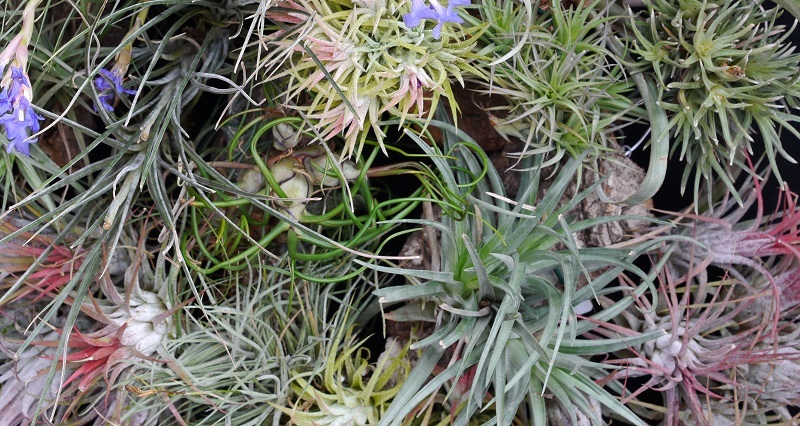 Left To Right – 1.Tillandsia Ionantha Mexico single plant, 2.blushing plant flowering and producing ‘pups’, 3.parent plant withering as ‘pups’ start to form clump. Once the offsets have formed and are semi-adult in size, the parent plant gradually withers away. The term monocarpic is often incorrectly applied to Tillandsia; in general horticulture this term is used to describe a plant that flowers, produces seed (using the last of it’s energy) and then dies as is the case with many bamboos. The term monocarpic doesn’t really apply here; Tillandsia bloom then produce seed AND offsets through which the plant or rather colony of plants continues to grow. Most Tillandsia are better compared to shrubs in this respect, that is to say when the main growth point (or terminal growth) is stopped side-shoots (lateral growth points or offsets in the case of Tillandsia) form and continue to grow…the plant is not dead and is therefore not monocarpic. There are a rare few Tillandsia that are monocarpic such as Tillandsia Rauhii, but these are generally not commercially available. IN THE HOME OR OFFICE – airplants make a great, easy to care for house plants. They require far less maintenance than conventional house plants. A great option to add a little life without the hassle! When it comes to displaying airplants, the options are really only limited by your imagination. Airplants can be grown loose or you can attach your Tillandsias to just about anything! As an easy to grow house plant, airplants are also a great plant for kids. 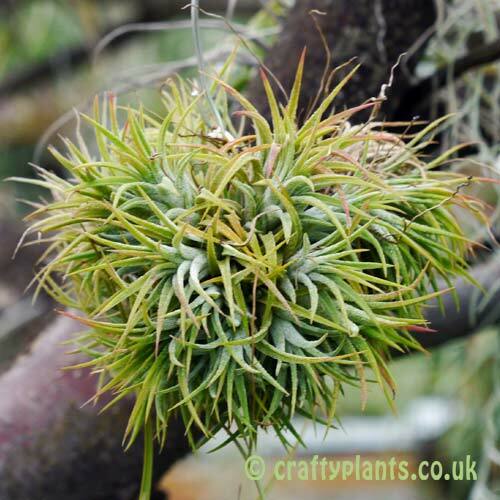 For Tillandsia care information please visit our airplant care page.